We offer innovative solutions, supporting customers in the development of their projects, in the improvement of their procedures, and in market growth. Hercules Motores prioritizes the quality of its products by offering: advanced technology, durability, reliability, accuracy, and high performance. Traceability and assured quality are managed by the CE and ISO certification granted by SGS certification agency, accredited by national entities such as Inmetro in Brazil, and international entities such as Ukas in England. With these certifications, in addition to selling in the domestic market, we are able to supply our products to the international market. Create a safe and challenging working environment, stimulating the development of collaborators. Continuously improve the processes, improving the management system. Protect the environment, acting towards the rational use of natural resources, reduction of waste generation, and the correct disposal, preventing pollution. Allow external providers with conditions to contribute with the development of quality and competition of both markets. We believe that this posture is essential to achieve the results planned by the company, assuring business continuity. 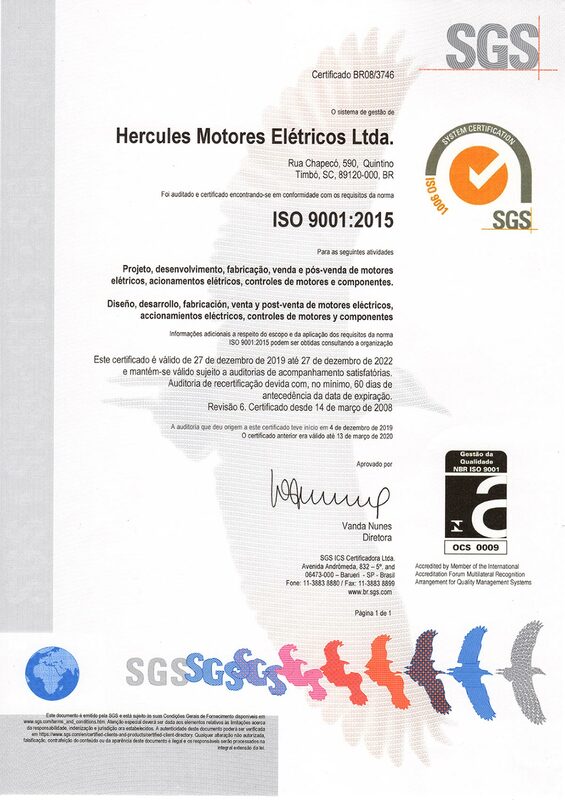 Hercules Motores, concerned with environmental protection and the protection of natural resources, disseminates such culture through environmental actions and campaigns, both internally and to the community. The company is also engaged in pollution prevention, controlling the generation of waste. The Hercules quality is assured by the excellency and quality of its exclusive services. The national coverage of the Hercules network of authorized assistance representatives and our advanced logistics aiming the replacement of original parts assure total customer satisfaction. Our Mission is to offer innovative solutions in electric motors, electric drive systems, and motor controls and components, with the best technology and applicable to all fields of activity. To become a company of excellency in the supply of electric motors, electric drive systems, and motor controls and components.